They include the first female physics prize winner in 55 years. Canada‌s Donna Strickland, of the University of Waterloo, becomes only the third woman to win a Nobel for physics, after Marie Curie in 1903 and Maria Goeppert-Mayer in 1963. Arthur Ashkin of Bell Laboratories in the United States won half of the 2018 prize for inventing “optical tweezers” while Strickland shares the remainder with Frenchman Gerard Mourou, who also has U.S. citizenship, for work on high-intensity lasers. 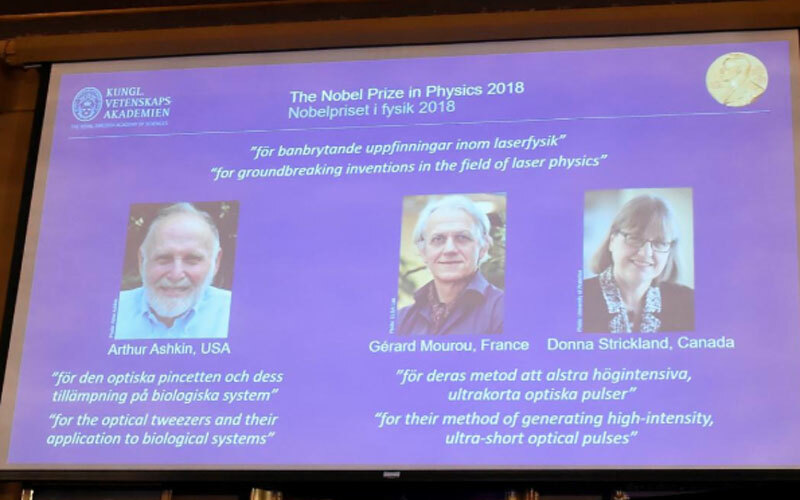 “Obviously we need to celebrate women physicists because we are out there and hopefully in time it will start to move forward at a faster rate,” Strickland told a news conference by telephone, shortly after learning of the prize. The Nobel prizes have long been dominated by male scientists, and none more so than physics. Strickland is the first female Nobel laureate in any field in three years. The Royal Swedish Academy of Sciences said last year it would seek to more actively encourage nominations of women researchers to begin addressing the imbalance. Her win comes a day after Europe‌s physics research center CERN suspended an Italian scientist, Alessandro Strumia, for telling a seminar at the organization‌s Swiss headquarters last week that physics was “invented and built by men”. Jim Al-Khalili, professor of theoretical physics at Britain‌s University of Surrey, said on Twitter it was “delicious” that Strickland had won the Nobel prize just days after Strumia‌s “misogynistic” comments. The inventions by the three scientists date back to the mid-1980s and over the years they have revolutionized laser physics. “Advanced precision instruments are opening up unexplored areas of research and a multitude of industrial and medical applications,” the academy said on awarding the nine million Swedish crown ($1 million) prize. Ashkin‌s work was based on the realization that the pressure of a beam of light could push microscopic objects and trap them in position. A breakthrough came in 1987 when he used the new optical tweezers to grab living bacteria without harming them. Ashkin is the oldest ever Nobel prize winner - but the 96-year-old is still busy with fresh research. “I am busy working right now, writing an important paper on solar energy,” he told Reuters in a telephone interview. Mourou and Strickland‌s research centered on developing the most intense laser pulses ever created by humans, paving the way for the precision instruments used today in corrective eye surgery and industrial applications. The prizes for achievements in science, literature and peace have been awarded since 1901 in accordance with the will of Swedish business tycoon Alfred Nobel, whose discovery of dynamite generated a vast fortune used to fund the prize. Physics is the second of this year‌s crop of prizes and comes after the medicine prize was awarded on Monday for discoveries about how to harness and manipulate the immune system to fight cancer. However, for the first time in decades no Nobel Prize for literature will be given this year after a scandal over sexual misconduct allegations saw a string of members leave the board of the Swedish Academy that awards it.